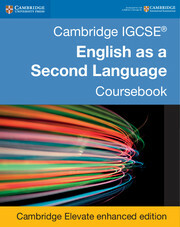 Supports students studying for Cambridge IGCSE® English as a Second Language (ESL). 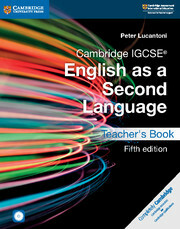 This invaluable teacher's resource includes a DVD which comprises of interviews with students talking about key topics as well as speaking test preparation opportunities to develop students' speaking and listening skills, two audio CDs which include new audio that is used for activities throughout the coursebook and workbook. In addition, detailed answers for all the key exercises are included for the coursebook and workbook and comprehensive advice and top tips offer support to teachers and suggestions for differentiated activities. Video and audio content for the speaking and listening activities. Suggestions for differentiated activities to support students at all levels. 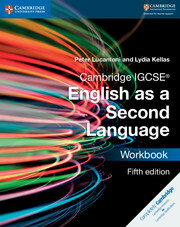 Detailed answers to all of the exercises in the coursebook and workbook. Advice and top tips to support teachers in effective delivery. Language Tips to help teachers to focus lessons on the vital language skills needed to succeed in the course. 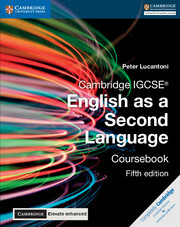 Audioscripts for the listening exercises in the coursebook are provided.